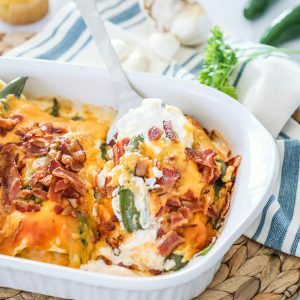 All of the delicious flavor of cream cheese jalapeño poppers are stuffed into this Jalapeño Popper Chicken Casserole recipe to make a quick, easy, and over the top tasty dinner. 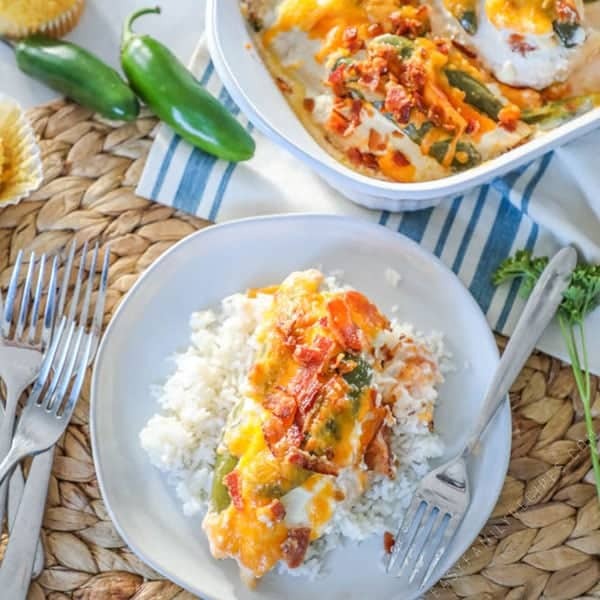 You will find tender chicken breast layered with cream cheese and topped with fresh jalapeño peppers and rich cheddar cheese and finished off with the perfect amount of crispy bacon. If you love jalapeño poppers as an appetizer you are going to go crazy for this easy dinner recipe. Not only is it super delicious, as a bonus, it is gluten free, low carb, and keto friendly! I have been creating easy chicken dinner recipes for a long time. I have quite a lot of them! When it hit me the other day that I had never put all the flavors of one of my favorite appetizers into a chicken dinner, it was kind of a “well, duh!” moment. I mean what could be better than chicken layered with cream cheese, peppers, cheddar and bacon? It was pretty much mean to be, right? So I started playing around, and it did take me a couple of tries to get the recipe just right, but this last one I made was definitely worthy of sharing, especially after it got high praise from my husband, who is pretty hard to please when it comes to dinner. He is my chief food critic, and after eating all of the hundreds of chicken meals I have made over the years, he is pretty hard to impress these days. The best part is that not only is this recipe hands down delicious, but it is also really simple with only a few ingredients and made in one basic casserole dish so you can get from the fridge to the oven in as little as 15 minutes. With a side of ranch smashed potatoes – These are our favorite! On a bed of sautéed spinach – Pictured above! I like to combine a veggie and a traditional side to make a nice rounded meal, but you can mix and match however you like and fits your family’s diet and taste preferences. If you have a great serving suggestion I missed, make sure and leave me a comment below so I can give it a try! This recipe is both super tasty and also super quick and easy! 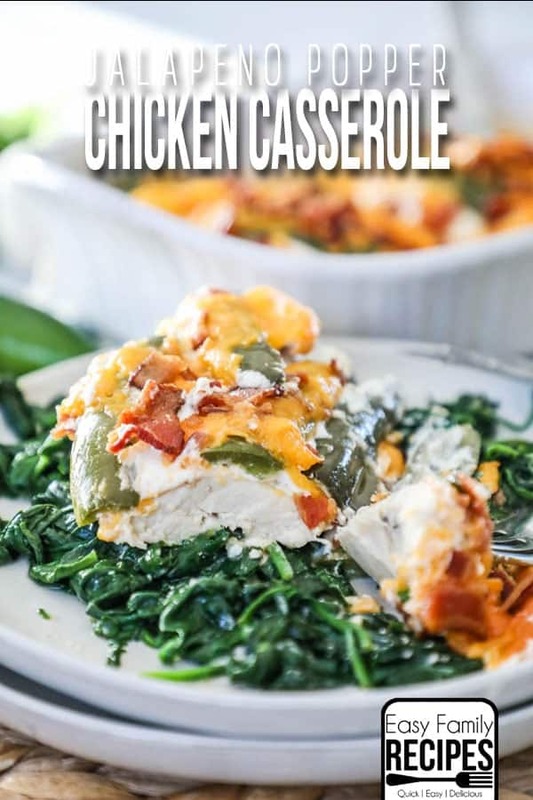 I am going to walk through some of my tips on making this Jalapeño Popper Chicken Casserole recipe, so if you have any questions, hopefully they will be answered below. If not, you should always feel free to drop questions in the comment section below and I will try to help! 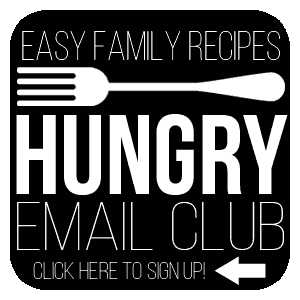 If you just want the quick version of the recipe, feel free to skip down to the printable recipe card at the bottom of the post. 2 lbs boneless, skinless, chicken breast- This will be about 3-4 average sized chicken breasts. If the chicken breasts are thick, I recommend cutting them in half so that they are half the thickness. This will help the dish cook more quickly and evenly. 8 oz cream cheese, softened- I use regular Philadelphia cream cheese when I make this recipe. You can also sub light cream cheese, but fat free cream cheese will not work will since it doesn’t melt the same way. 1/2 pound fresh jalapeño peppers (about 5-6 peppers)- You can find fresh jalapenos in the produce department of any grocery store. 4 oz sharp cheddar cheese, grated- I really prefer sharp cheddar for this recipe. It is great because it packs a lot of flavor. If you are in a pinch you can substitute mild cheddar or mexican blend cheese. 1/2 cup crumbled crispy bacon- I think fresh bacon works best for this. I like to cook bacon in the oven like this and then throw the leftovers in a bag in the freezer so I can reuse them easily in any recipe. Make sure the bacon is nice and crispy, then crumble it up until you get half a cup. A few notes on making this recipe so that you get the best results! First, make sure your chicken isn’t too thick. As mentioned above you can cut it in half to make it thinner so that it can cook more quickly and evenly. Also, since most chicken breasts from the average grocery store are more than one serving, you can cut them up before you place them in the casserole dish if you want, or use chicken tenderloins instead. The smaller you cut the chicken, the more quickly it will cook. Make sure that your cream cheese is nice and soft. You want to be able to spread it easily on top of the chicken without a big hassle that it will give you if it is still cold. If you didn’t take it out of the fridge earlier in the day, you can pop it in a microwave safe bowl and heat it for 30 second increments, stirring in between until it is smooth and soft. This is a BIG one! How the jalapeños are prepared will determine how much heat this dish has. First you will wash the jalapenos, then if you want the dish to be mild, trim all of the seeds and ribs out of the peppers before slicing, If you want a little more heat, leave some seeds and ribs. The more seeds and ribs left in the peppers, the hotter the end dish will be. I sliced out all the seeds and ribs from mine and all 3 of my small children ate it without complaints of it being spicy. When you bake this, you do not have to cover it. It helps the extra liquid released while cooking to evaporate when you cook it uncovered. Also, once you take it out and add the bacon, you want it to be uncovered so the bacon can continue to cook and retain it’s crispiness. If you do notice it getting more browned than your liking, you can loosely cover with foil, but remove the foil once you add the bacon to the top. All of the delicious flavors of Cream Cheese Jalapeño Poppers are packed into this delicious dinner recipe! Jalapeño Popper Chicken Casserole is both delicious and quick and easy to make which is a winning combination for a busy day's meal. As a bonus this recipe is also gluten free, low carb and keto diet friendly. Lay chicken breasts flat in a casserole dish. Season them with the garlic powder then spread the cream cheese over them evenly. Wash the jalapeño peppers and then cut the tops off. Remove the seeds and stems if you want it milder, or leave some if you want more spice, then cut the peppers into strips and lay them on top of the cream cheese then sprinkle the cheddar cheese over top. Bake for 40-45 minutes, remove from oven 5 minutes before cooking is complete and sprinkle with bacon then return for the remaining cook time. Chicken is done when cooked through to an internal temperature of 165˚F. Serve warm with a side of potatoes, veggies, or a baked potato. Enjoy! Now that is a HUGE win! Thanks for sharing that with me. I have 3 small kids of my own and know what a battle that can be. Let me know what else you get to try out! Happy cooking! Hi Maritza, I would leave it at the same temperature, but the cooking time will probably be less. I would check it around 20 minutes but it will probably still need closer to 30-35. It vary depending on how big your dish is, your altitude how your oven cooks, etc. Did it for 30 mins and it was not enough. 5 mins longer still would not be long enough. 45 mins were perfect. Can i use canned jalapenos ? Hi Leila- You can use canned jalapenos but it will taste significantly different. It will still taste good, but very different from using fresh jalapenos. I have done both and prefer fresh. I made this and the kids, and my friends who ate dinner with me loved it. The only problem I seems to have was there was a ton of liquid in the casserole dish and I feel like a lot of my cream cheese had come off with the liquid. Anyway to fix this? Did I do something wrong or maybe I had really juiced chicken? Help please. Oh I forgot to mention I also made the smashed ranch potatoes and the sautéed garlic green beans and everything was amazing. Hi Jennifer- I am not an expert but I do cook with chicken a lot. I find that some chicken actually has liquid injected into it to make it look more plump and sometimes this can cook out while you are baking it and make a lot of liquid in the pan. Actually quite a lot of chicken has this, both fresh and frozen, and you can usually find it in the fine print on the package. I didn’t really have that issue when I made it so it could be the chicken that you bought. One thing that might help a little is making sure the cream cheese is piled right on top of each chicken breast and not just spread over the whole top. It will melt down a bit, but shouldn’t really fall off. If it does fall off, you can actually mix it into the liquid at the bottom and spoon it right back on to solve the problem too. Hope that helps some! You can buy air chilled chicken. It is a little more expensive but doesn’t have the liquid that other chicken does. And it has better flavor. Your chicken was probably typical commercial grocery store chicken; injected with saline to plump it up… that creates a lot of additional juices when cooking. Try truly organic chicken. It will look small and flat compared to Fosters or similar brands, but is healthier in the long run. Could I use banana peppers instead? Hi Mandy- You could use banana peppers in this recipe, however it will taste significantly different. My guess is that it will still be tasty, just much different than the recipe above. If you do decide to use them, make sure and fully drain them before putting them on the chicken so there isn’t too much liquid in the end. Hi Tammy- I do not cover it while baking, however, every oven cooks differently so if you find that it is getting more browned than you like, I would loosely cover with foil toward the end of baking. It was fantastic! I was just sure that it would be terribly hot but was amazed that the dish wasn’t hot at all! We all absolutely loved it! I will definitely add it to my “keeper” recipe list. Isn’t it so neat that you can vary the temp on this recipe just by taking out the seeds and ribs? I was amazed how well my kids ate it and not one even mentioned it being spicy! There is no heat in the seeds just in the ribs and pith and the amount even in those will depend on the year. You could use regular bell pepper, but it would significantly change the taste of the recipe. I think it would still taste good, just different. Now, do realize that if you take out the seeds and ribs on the jalapenos, this dish really isn’t spicy. My 3 kids (ages 3-7) ate it without even mentioning it is spicy. If you want a similar recipe that uses bell peppers, these baked chicken fajitas are really popular too! I did not know that. I have never cooked with them as I always assumed they were too hot. Thank you !! I am trying this method today. And I have decided to cube my chicken. I am going to try cooking 40-45 minutes. I can’t wait to try the spicy recipe when football season begins, which is very soon. Thank you so much for sharing this recipe. My husband loves jalapeño poppers so I know he will love this as well. I just bought some jalapeños so I will make this week for sure. Thank you again. Blessings! I hope he really loved it! We sure did! It will be fun to play with how much heat to leave in if he is a jalapeno lover! Enjoy! Made it exactly like it says and the after only 30 minutes the chicken was still pink and the cheese and jalapeños were burnt. What a waste. Hi Ann- My guess is that your chicken was probably pretty thick. If you cut the chicken into thinner pieces it will help. Also, as noted in the recipe, I don’t cover my chicken, but since every oven bakes differently, if you notice yours getting too browned you can cover it with foil until it is done cooking to prevent it from burning the cheese. I used fresh jalapeños, cut up about 7, used ribs, seeds , the whole thing, added a little Franks Hot Sauce to the cream cheese & s little Slap Yo Mama over all before the cheese & these construction workers I cook for loved it but STILL wasn’t spicy enough for them. They said it definitely has a nice kick & would have loved it with tortillas instead of rice. So guess what they’re taking for breakfast! So glad they enjoyed it. That is a funny story. You will have to tell me if you find something spicy enough for them. Maybe add some red pepper flakes next time too! Try sliced habaneros along with the jalapeños, that will take the heat level up some without changing the taste very much. So bummed, nobody liked this but me. I enjoyed it , but my husband and son both really disliked it. Hubby said the cream cheese made it bad and the plain chicken..
Has anyone ever topped the cheddar cheese layer with some breadcrumbs and alittle melted butter to simulate the breading of a popper? Might have to give it a try. I do this sometimes and it is really delicious. I find that it works much better if you use cheese slices rather than shredded cheddar cheese if you want to add the bread crumbs so they don’t fall down in between the cheese as much. This dish was pretty tasty. It was a little watery though, which I read in other comments about the chicken sometimes doing this. I was afraid of over cooking the cheese, so I cooked dish for about 20 minutes, then added cheese for the remaking cook time. This worked well for not over cooking the cheese. We also had ours on warmed tortillas. I would suggest browning the chicken in a skillet to lick in juices and then proceed with recipe. That’s what I’m going today. Seems more logical for this dish. How did it turn out, Renee? Seems like a good idea! My cheese got crisp also…. was i suppose to sprinkle is after i took it out and add it with the bacon? I added extra cheese with the bacon; had the same thought about crispy cheese. It did help. Definitely a keeper! I’m always looking for new low carb dishes for my diabetic husband, and this one fit the bill! Thank you! I tried this tonight, the taste was great. I used tenders and cut them up into pieces. My issue was it was really runny. How do keep that from happening? My husband doesn’t like cream cheese poppers. He prefers the cheddar cheese ones. What would you use instead of cream cheese? I would mix cheddar into the cream cheese. If you heat it then it will combine to a cheddar flavor but keep the popper consistency. Made this two days ago for just the two of us. I used fresh jalapeños and left some seeds and all of the ribs. It was spicy but we in Texas like that. My husband is not a fan of chicken but he loved it. The next night I put it in a smaller baking dish, covered with foil and heated in oven at 200 degrees for about an hour. Was as good as the first day. Followed recipe exactly. Great recipe. Thanks! Just made this and it was really yummy! I pounded and cut my chicken breast into strips, added green onions and baked for 40 mins. Chicken came out super tender. Waited a little while and the sauce really thickened up, ate it with asparagus.. Will be making again. Boyfriend will love it. I added up all the dietary ingredients for this dish, and most notably the sodium content of my whole dish was barely over 3100 mg of sodium. This equals less than 375 mg of sodium per serving. Way healthier on that note. Plus, good eats, too. Thanks for the recipe! Made this last night. Oh my goodness!! It was Delicious & a huge family hit. Even my 4yr old (who is picky) had seconds ! Thank you for this! I made this tonight and it was a big hit. I placed sliced Yukon gold potatoes on the bottom with chicken and toppings on top. It was great. I also used thighs instead of breasts. Will definitely be making this again. It’s so easy and good! Only change I would make is wait until the end to add the cheese. We made this 2 times within a week! Super easy and so good!! Made this last night, so yummy! I chose to dice my jalapenos and then gave it a quick sautee in a little of the bacon grease, this helped tame the spiciness of my peppers a bit. Thank you for the great recipe! Good, but mine also had LOTS of liquid at the bottom, which was disappointing. As someone else commented, I was thinking that it could have been that some chicken breast has water injected. I don’t know how to fix that problem. This was a great dish for those watching carbs. WOW! I recently began easing into the “keto” diet, and I think this is a recipe ALL keto-dieters should keep in their pocket! I had liquid in the bottom of my pan like others have mentioned, but personally, I didn’t mind. I just took a spoon and poured it on top! I also put the bacon UNDER the cheese, so it held the bacon in place. With that being said, I waited to put the bacon AND the cheese on until 10 minutes left of baking. I really enjoyed this recipe! Will be making again and again and again! Can I wrap the bacon around the chicken after I put the cream cheese?? Do you think boneless, skinless chicken thighs would work? I know they’re a bit fattier than breasts. Any tips are greatly appreciated! Looks yummy! How do you think boneless, skinless chicken thighs would work? I know they’re a bit fattier than breasts. Any tips with that are greatly appreciated! Thanks! I made this last night and it was delicious !! The only thing I changed was that I used Kraft jalapeno cream cheese instead of fresh jalapenos. This will stay in rotation for my family. Was kind of disappointed in this recipe.I used thin breast cutlets and cut cooking time to a total of 33 minutes. Peppers were hard and crunchy. Should they be? Also quite bland and tasteless although i added a little cilantro for a pop. I’ve tried another similar recipe using canned jalapenos and taco seasoning, along with some green chili taco or salsa sauce. Found it much more flavorful than this one. Bland and tasteless, not sure how you could think that…. How do you think this would do in a crockpot??? I was wondering the same thing. Or in the instant pot! This was delicious! We ate it with tortilla chips and salsa and it worked well. I thought I’d have leftovers to take me into the week as there are only three of us, but it got eaten entirely! The best thing ever…. we love it!! Just made this tonight, very tasty though mine turned out pretty soupy. I think next time will cut the chicken into cubes for easier eating and will put rice in to absorb the liquid. Otherwise, it’s delicious! I’m in the kitchen right know putting it together my question is Do I cover it up whi and e cooking. This is incredible! I have made it twice in the past 2 weeks and my family devours every crumb! Thank you sharing! This looks delicious! I love spicy stuff but I can’t handle it too well. I always end up red-faced and chugging milk. Still doesn’t stop me! I can’t wait to try this. Made this twice now. Very good As is. Second time used Monterey Jack cheese and left some veins on some of the peppers. Also added a bit od adobo seasoning ro chicken. Made this for a large gathering and was a huge hit. Was so easy. This one is a keeper. This is SOOOOOO goood thank you for sharing. My fiancée LOVED it! Will make again when the weather cools down a bit. Our son even ate some and I can NEVER get him to eat my chicken so last night was a big win for me. I made his separate without the jalapeños as he’s a small toddler. We’re Latinos so I went ahead and left all the seeds and stems in the dish and it was sooo yum! I forgot to get a plated picture because my hubby ate it up so quick. Thank you for this delish recipe! I wonder if u can add crushed pork rinds to the top? the favorites file. SO easy and I also think one can change it up to your own needs. WILL start following you for more easy meals! Subbed 1lb organic ground chicken for the breast and I loved the taste and texture! Didn’t hurt that it reduced cooking time as well. Left seeds and pits in my jalapeños and loved the spice. I made this recipe last night and chopped the jalapeño and mixed it with the cream cheese. It was delicious. I just wish I had worn gloves to cut and clean out the peppers My hands and face were on FIRE 🔥 😲🤒. Love and learn 😊. This is a family favorite! I have it pinned on two different boards. Both were blocked today. Weird…glad I was able to find it again. I am such a picky eater and I can’t do anything even mildly spicy. I made this for my husband but thought I’d try it too even though it had jalapeños. It is by far the BEST dinner I’ve ever made and is our new household favorite!! I did take all the seeds out of my jalapeños to avoid being spicy. But wow this was incredible. I used mozzarella cheese instead too. SO glad I found this recipe!!! I have never left a review on any other recipe but I had to on this one! How would you suggesting cooking it to freeze is and cook later? Made me not want to eat it. 4 extra jalapenos. Too few. Needs 10 -15 more. If not 20 plume serrannos or some habs. Mine was watery but there was no lack of flavor. I just served the ‘juice’ as sauce along side the chicken. I felt the casserole was heavy enough by itself so served with green salad (mixed ranch dressing with taco seasoning) and some tortilla chips. Great meal to kick off college football season! Husband is not a fan of hot stuff, left the seeds out and he really liked it. I loved it! Will definitely put this into the rotation for dinner recipes! Could you freeze this meal? Has anyone tried this in the crock pot? Silly question…. is this baked with casserole lid on of off??? We didn’t not like the recipe . To watery and not very eye appealing . Did have some flavor . But 4 of us said don’t make it again. Have you tried putting some crushed corn chips in the bottom of the pan to help absorb some of the juices and add flavor? Can you prep this the night before? THIS DISH WAS AMAZING!!! I USED SLICED JALEPENO’S ALREADY IN THE JAR.MADE SOME RICE WITH SAZONE,CREAM OF CHICKEN AND BLACK BEANS AND CORN. BAKED THAT WHILE THIS CHICKEN DISH WAS BAKING AND THE TWO WHERE ABSOLUTLY AMAZING!!!! I made this tonight as written but spiced up my chicken with Adobe and Sazon along with garlic powder and added a couple thin slices of Monterey jack cheese on top of cream cheese. My family of 4 could not stop raving about it! Thank you for this recipe! It will be in our dinner rotation for sure ! My son and I made this tonight and it was so delicious. I serve it over rice but I’m going to put the leftovers in tortillas. Honestly one of the best Friday night meals I’ve made in a while. I chose to use chicken tenderloins and I baked it for 45 minutes put the bacon on and did another 10 minutes, it was perfect! I wish I could say differently, but this literally had zero taste. So odd given the good reviews on here. I don’t know what happened. simple enough to follow and make… but sadly, pretty bland. Might try again, but Im not sure its worth it. Thank you thought! I’ve made this recipe twice, both following the directions almost exactly. Only think I did different was to add some dried minced onion to the chicken along with the garlic. Both times, this dish has turned out AMAZING! I remove all the seeds from the jalepenos so the kiddos can eat it too. Thank you so much for sharing! This is now one of hubby’s favorite dishes and it’s pretty simple to make. This was so good! Only things I did differently was to use 1/4 tsp garlic powder and 1/4 tsp smoked paprika instead of just the garlic powder because I think smoked paprika makes everything better 🙂 I used turkey bacon instead of regular bacon and I also waited until the last 15 minutes to add the grated cheese. Served it over sautéed spinach with a side of potatoes. Super-duper good and easy dinner. Thank you for sharing your recipe! It’s a keeper for my household. This turned out really great! I substituted the jalapeño for a small can of Hatches green chilies and a can of Rotel (I drained the liquid from the Rotel). I also had thicker cuts of chicken and put tin foil over the top of the pan to keep the cheese from getting too brown like suggested in previous comments. I baked it until it reached 165°F (about 45 min). I will definitely make again! Do you cook bacon in the oven first before you put in on top?? I just made this recipe. I bought already really thin chicken breasts flattened and seasoned. I used garlic salt instead of powder. I covered it up and cooked for 45 minutes, then put the bacon on. It was fabulous served with baby potatoes and sweet carrots. I had a little bit of juice, but I poured it off when it came out of the oven. We have a winner winner chicken dinner. Made this exactly as written for my husband trying the keto diet and he LOVED it. I’ll be making this over and over again. Thank you! This is so delicious! I think the chicken breasts I used were extra large, so I had to bake it for about an hour. Thinking about making taco soup with the leftovers.